Funnily enough, I don’t take a computer with me when I’m on holiday. I like to get away from the things once in a while. It does however mean that I have to do things the old fashioned way when preparing these blog posts. Every night I’d sit down with a coffee or beer, get out the notebook and put pen to paper and I’d write about the day. So I begin with getting out of bed and getting on the 08:55 bus out of Ulvik. We were heading to Bruavik – the ferry terminal about ten minutes down the road. The day before we’d picked up a leaflet in the tourist information office marked “Self Guided Excursions” – a collection of trips you could take entirely by public transport. 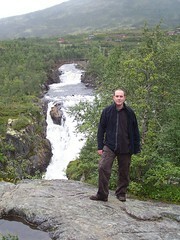 Two of the trips took in Eidfjord. One would take you just to the Hardangervidda Nature Centre and would leave on the bus we were on. The second left on the 11:10 express boat, did the nature centre then saw you go to the Vøringsfossen waterfall. Both then got the 14:40 express boat back. To be honest, both looked less than ideal – they got you back to Ulvik far too early – so we decided we’d concoct our own excursion. We presumed that, because there was a way for the people on the express boat to get to the waterfall, we’d be able to do it some how as well. After all, how hard could it be? Local transportation company HSD operated the buses and ferries in the area, and each was well interconnected. The bus pulled smoothly into Bruravik in time for the ferry, which connected at the other side with the bus which took us to the nature centre. The nature centre itself turned out to be in Øvre Eidfjord – a few kilometres from Eidfjord, with the bus pulling up outside the building. The Centre is effectively split over two buildings – one is the main centre itself, whilst opposite was another building housing a cafe, gift shop and a goat keeping the grass on the roof short. The Centre was an excellent visit, where the main attraction was another panoramic video of the area – well edited with some blindingly wonderful sea-sickness inducing shots followed abruptly by a static picture of some birds standing still and going cheep. This was then missed with a lemming about to be grabbed by an eagle, a reindeer about to be shot by a man lying in the snow and then a nice cut to a waterfall. It was surprisingly similar in style to the one in the Glacier Museum a few days before – well okay, not that surprising really as it was done by the same person. The Nature Centre ticket office doubles up as the local tourist information office, so having had our fill of nature, we asked how we’d be able to see the waterfall and the fabous Måbø valley. Not easily it turned out. 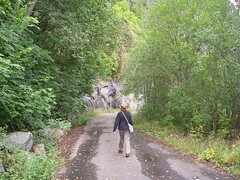 There were no buses – we’d have to walk about 5km to Måbødalen and then catch the “troll train” up the old road to the top. As we didn’t have another plan, we set off walking up the main road. Half way up, we came across a rather surreal sight – the framework of a small house like thing, just metres away from the main road. Most people – being in cars or buses – would never have seen it, but being on foot, we moved to have a closer look. Named “Kallebu”, going inside looked even more surprising. 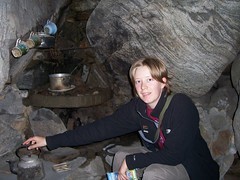 The tiny house was equipped with chairs, kettles and cups! Inside was no occupant, but someone had obviously gone to a lot of effort to ensure that the occupant was comfy in their home! As it’s not marked anywhere on our maps or guide books (and indeed I found no reference to it in Google) we can only assume that Kallebu was a troll house. 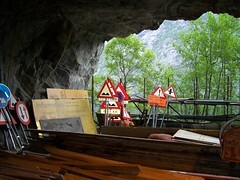 How many people see this sight on the road up the Måbø Valley must be few. We were certainly lucky. After that excitement, the walk uphill was more sedate as we marched along the side of the verge with Norwegian cars and coaches zooming past us. 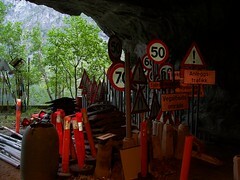 Not knowing how far we’d gone, we eventually saw a sign that filled us with hope – 500m to the “trolltoget”! A little further (500m actually) and we found where the train went from. We were the only people around, but by sheer chance we found we were just in time for a train. We spotted the same kind of response in Iceland the year before. In the US that kind of statement would have elicited a huge response, and in Britain a definite “Gosh you must be exhausted!”, but in Norway you just get a “Yes”. Now I don’t mean that in a bad way – it just seems to be that some nations don’t really do elaborate small talk quite like we do! The troll train is one of those motor vehicles that looks like a train, and it goes up the old Oslo road that was replaced by lots of tunnels in the 1980s. The old road itself is without doubt a masterpiece of Norwegian road building – twisting and turning steeply up the edge of a mountain. It must have been a nightmare to travel on in those days, being only a single lane for most of it. Apparently the traffic jams could last hours. For us however, being the only people on the road, it was a pleasant drive with some stunning views – which sadly couldn’t be photographed due to the plastic train windows. We got to the waterfall car park around 12:50 and were told the train was going back down in ten minutes – if we weren’t on that we’d have to wait an hour. Rather that wait looking at a single tourist shop for an hour, I suggested we quickly find the waterfall and catch the train back. Despite being signposted, we seemed to scramble through trees before we found what we came to see – and we quickly admired the view before rushing back just in time to board. With 10km or so of walking done, by the time we got back to Øvre Eidfjord we were in need of some food and there was nowhere better to eat it than the Nature Centre cafe. Actually it seemed to be the only place, but then it was a good choice. The cafe is well known for its high quality food made with local produce. Catherine ticked into a tasty pasta with marrow, garlic and Parmesan, complete with salad, whilst I had a superb grilled trout with boiled potatoes and a nice (but unknown) sauce. It was fantastic stuff, so to celebrate we had desert. Catherine picked a meringue thing whilst I had some berry cake. Lovely and well recommended! 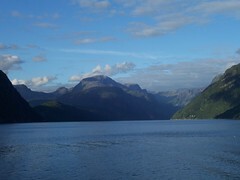 It was 15:45 before we left but this left us with a question – how to get back to Eidfjord. There was no bus until 17:45, and not a huge amount to do in Øvre Eidjord. The fact that the prepared excursions ended around 15:10 suddenly made sense. In the end we opted to walk down to Eidfjord where (ironically) we’d catch the bus we could have got from Øvre Eidjord, but we’d have time to look around. Of course the fact that the walk was 7km didn’t bother us. 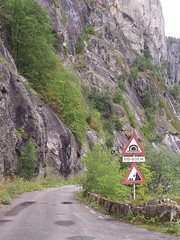 Not far from Øvre Eidjord the main road goes into a tunnel, and not being allowed in, we followed the old road along the side of the fjord – old roads in Norway have a habit of becoming foot and cycle paths. There was not a sole around, and it was a lovely walk along what must have once been a busy highway but was now full of grass poking up through the cracks in the tarmac. I have to say the thought of going into the tunnel for nearly half a kilometre didn’t exactly enthuse me, but it was still lit. 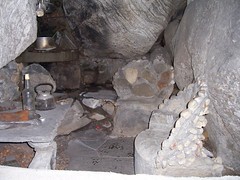 It did however feel rather creepy and mysterious – more so once we found something half way through! Yes right in the middle, a collection of road signs behind a metal fence, with a fjord behind it. Very strange indeed! 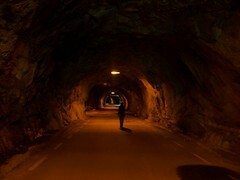 The rest of the tunnel was pretty uneventful and we were soon back outside and eventually back on the road. All in all it took us about 90 minutes to walk to Eidjord, and having walking around 17km in the day I was feeling a bit tired. With half an hour for the bus, I went in search of something to drink and found the supermarkets closed so ended up in the enticingly named “Melt+Go” where I had a “funky orange Fanta”. No idea what was funky about it though. The bus stop was near the local depot and some buses were parked randomly outside, with another across the road filling up in the petrol station. After a while, a bus drove in with no destination, but claiming to be ours so we boarded and got a through ticket to Ulvik (another benefit of the ferry and buses being the same company). Another bus came in and other people changed onto ours. The bus drivers seemed to engage in a debate about someone’s ticket which eventually came to a resolution but by this point the bus is late, so a sudden departure would be necessary. But wouldn’t happen. Another delay was caused when one of the passengers said (or so we could gather) that their friend was at the petrol station. Why is another matter, but this lead to a heated debate and much pointing. Whatever was going on (in Norwegian) the bus driver was defiant that he’s leaving shortly, but never-the-less leaps off the bus, quickly chats to the other driver and puts his foot down. The passenger who had wanted the bus to wait for five minutes, had now got off and was running to the petrol station as we zoomed out. For now we were really late and if we were late we’d miss the ferry. And if we missed the ferry, passengers wanting to go to Ulvik and Voss would miss their connections on the other side of the fjord. And goodness knows what else would go wrong. In short, if this one bus is late with its thirty or so passengers, the whole of the Norwegian integrated public transport system would fall completely and utterly on its face. This was serious and the bus driver knew it. Within moments we were hurtling at top speed and beyond along narrow, twisty roads which ran alongside the edge of a very deep looking fjord. We were zooming along as fast as the driver could take us. Norwegian bus driver honour was clearly at stake as the driver went round several sharp turns whilst shouting down a mobile phone – presumably to tell the ferry staff he was on his way. There is no doubt – this driver was well above the speed limit, so it’s a damn good job there was no police about, but the man deserved a round of applause. We got to the ferry literally just in time, as the entire bus almost ran off the vehicle and onto the ferry. Norwegian bus driver honour was safe for another day, no thanks to one idiot who wanted a Pepsi when they should have been boarding the bus. After the ever so slightly manic ride to the ferry, the trip back to the hotel was slightly more sedate. Our connecting bus pulled in mere moments after we’d disembarked and we had an uneventful drive to the hotel where we had yet another “interesting” meal – potato wedges (again) with a rather tough steak with peppercorn sauce, whilst Catherine had a pretty awful veggie sausage with wedges… This was followed by an odd ice cream thing, and I had to raise an eyebrow when the people on the table behind us said the meal was fantastic. Fantastic did not describe that meal. The food at the nature centre was fantastic. This was just plastic. And with that winge, a pearl of wisdom. Most of the glasses for beer were 0.5L with a line mark. After a while I realised something. They were almost identical to the pint glasses we get in the UK. In other words, despite being metric, the Norwegians were probably drinking beer out of a glass designed to hold an Imperially-measured quantity of liquid! And why not? A pint is, after all, 568ml. Why make two different sizes of glasses, when one could do. And with that, the day came to the end, and we retired to bed. And long may it do so! On our visit we didn’t see anyone else stop and see it. Everyone just zoomed past in their cars or coaches, which is a real shame. It was certainly great to visit, and seemed to fit quite nicely into the rest of the rather surreal day. Definitely one of the most memorable days of our holiday! Thanks for letting us know the story behind it. I’m Karl Heiland’s daughter, and I got almost shock when i google Kallebu and found this articel. I am glad that you have been there and look how my father lived in the summer during he was fishing in the river. During one summer (2month) he catched 169 kilo salmon in the river. He lived in the little house, and I remember he told me that he feeded one mouse that summer.The mouse came there every day, and he had always someting to give to the animal he loved so much. 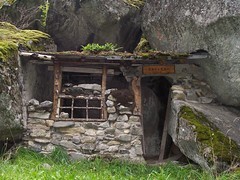 Trough all the years he was there, it came people from the hole world to take picture of him and the little house. My father died at mars 1985 after a big hertatache. We lived in Ål in Hallingdal, and we tried to travel over to Måbødalen to look after the house. I’m sorry that my English write is no good, but I hope you can read this. Next time you come to this part of Norway you can call me and mayby we can meet somewhere. Don’t worry about your English – it’s far better than my Norwegian!